Its ‘Bout Time Upholstery is located in beautiful Bellevue, Washington off Bel-Red Road. 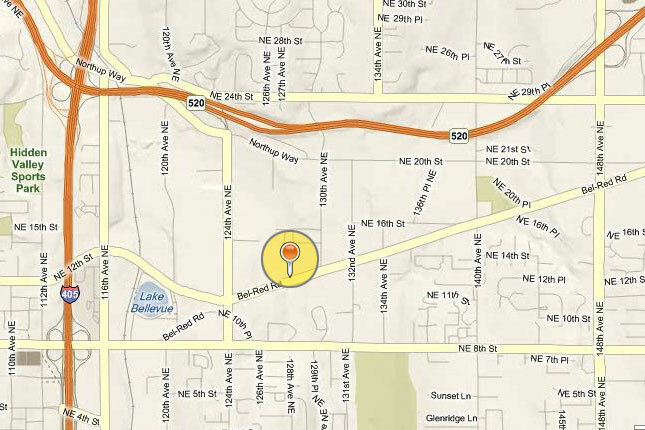 We’re located in Evan’s Center right between Safetylite AutoGlass and the Washington Shotokan Association. There are a number of shops located in Evans Center. Some of the other great Bellevue shops located in Evan’s Center include Bel-Kirk Mustang Parts, Restoration, & Repair, Bellevue Bedrock Supply, Green Gardens Greenhouse Supply, Mr. Tint & Sun Window Tinting, and Superior Auto Trim. Just across the street you’ll find Great Floors and further down the road Carpets to Go.